Earth is going to face global-scale problems in the next 50 years. But we lack a Design System to tackle challenges in an holistic way. So, we’re creating an innovative Framework for Earth Design. 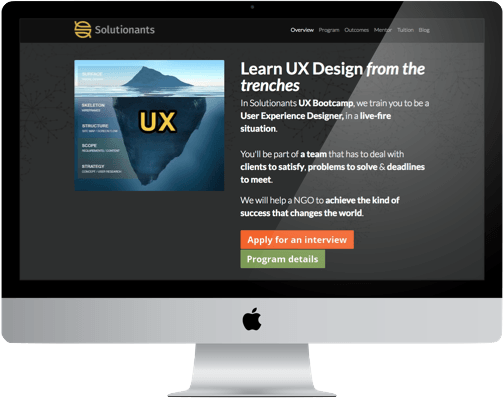 I created this UX Bootcamp training, in which we coach User Experience Designers in a live-fire situation. Each student is part of a real team, that has to deal with real clients (NGO’s), real problems to solve & hard deadlines to meet. 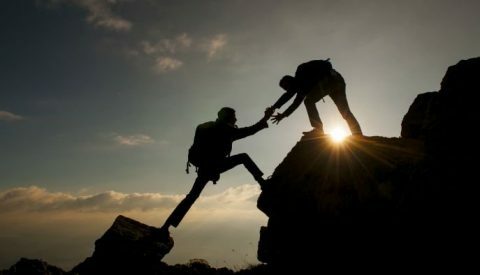 A personalized mentorship that looks not only to help UX Designers to evolve and get to their professional goals, but to become the best version of themselves. For this, I use all what I’ve learnt from Psychology, Business, Design and the QLA framework by Dan Peña. A few years ago, I was failing 90% of my sales. I then decided to hack the delicate process of selling UX. This short book is the result of that process. It contains a field-tested questionnaire that has taken drastically down my [time spent] / [money earned] ratio ever since then I implemented it. Available in Kindle Store and as a free pdf. User Experience is a beautiful discipline, but full of details that largely exceed the traditional design or development foundations that UXers usually have. This UX Consultancy Bundle composed by three self-paced courses and two books aims to provide those strategic skills, with practical guides, checklists and templates ready to use. This content has helped more than 15,000 students via Stackskills, Udemy, Edurila and Skillshare. I have led a 5-person UX team to work in a conceptual approach on how re-create democracy in the 21th century. We crafted the new version of DemocracyOS tool, ought to be used in parliaments, parties and decision-making institutions. 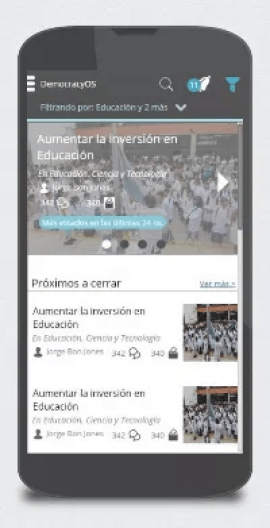 Democracia en Red Foundation was our partner in this process to take DemocracyOS web version and take it into mobile. The result of this intense 6 month process? A fully functional prototype that allows users to get informed, join the conversation and vote on topics, just how they want their representatives to vote in congress. Banks and financial institutions usually provide clients with less than few options to save money, offering very low returns based on obscure finance. Neerva was the alternative, providing an easy way to save directly in bitcoins. 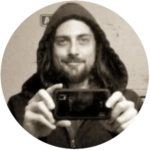 This short-lived project allowed me to use a full array of skills, from UX design to financial forecasting, from interaction design to business model creation. We created a video pitch and a prototype, and presented it for Startup Chile 2014 edition. Complete the form to receive articles and news! Here I worked alongside Trusted Rebels Agency to improve the UI and UX of an ongoing project for one of the most respected companies in the weighting industry. 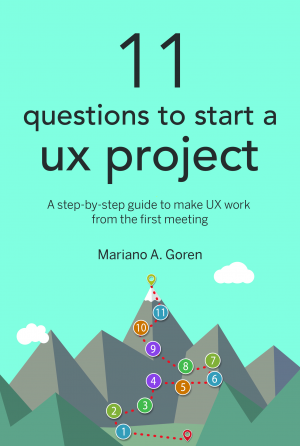 The UX research & wireframing process helped the team to understand the users lifecycle and identify new business opportunities to be tackled thru growth hacking techniques. 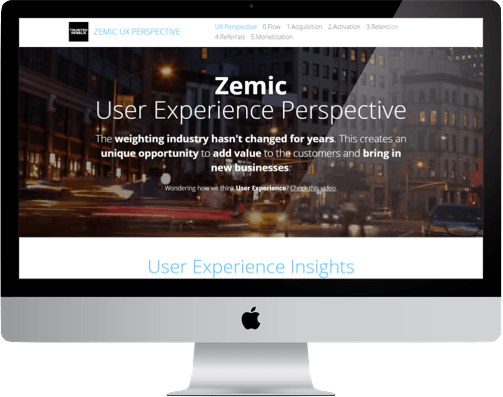 You can also check the final version of the site of Zemic Europe. The client –one of the hottest startups of entertainment industry, asked me to get a quick & dirty functional prototype to pitch to new investors and clients. After almost 20 hours of non-stop work, we got into a simple but functional prototype that streamline the sales process. The result? In 2016. the company was effectively sold to C3 Presents, part of the Live Nation group. Mission accomplished! My first education project was about helping latin american people to effectively implement a digital business strategy. The venture included academic coordination partnerships with Universidad de Palermo and ITBA (Instituto Tecnológico de Buenos Aires) to work in several instructional design projects. I created and produced this series of long-play interviews with people that I like. This content is for curious people that like to know more, learn more, and thrive. Available in spanish via YouTube.